Despite living on the driest continent on earth we always seem to find on our trips a decent body of water that needs to be crossed. If we were being honest we probably went out of our way to get there just for the fun of it! This could be a flooded clay pan in the Simpson, less than half a metre deep but a couple of hundred metres across, the twenty odd crossings of Crooked River just out of Talbotville or a once in a lifetime Cape York drive to the tip of Oz. Sometimes it will even be unexpected on a Sunday drive in your local forest. All of these scenarios have one thing in common – the need for vehicle preparation and proper driving techniques. In your fourbys’ owners manual there should be listed a maximum wading depth. If it’s not in there, or you threw away the manual with the DVD player instructions and other stuff blokes don’t need, then get on the web and search or call your local dealership to find out. For the majority of 4WDs out there it will be between 400mm and 600mm. If we want to exceed that amount, or want to be extra safe, we need to take precautions to try and prevent damage to the vehicle and its cargo. The first step most of us take is to install a snorkel to lift the engine air intake from headlight height to a point near the roof. Be aware that some brands of snorkels are designed and sold to help with reducing dust not preventing water entry. 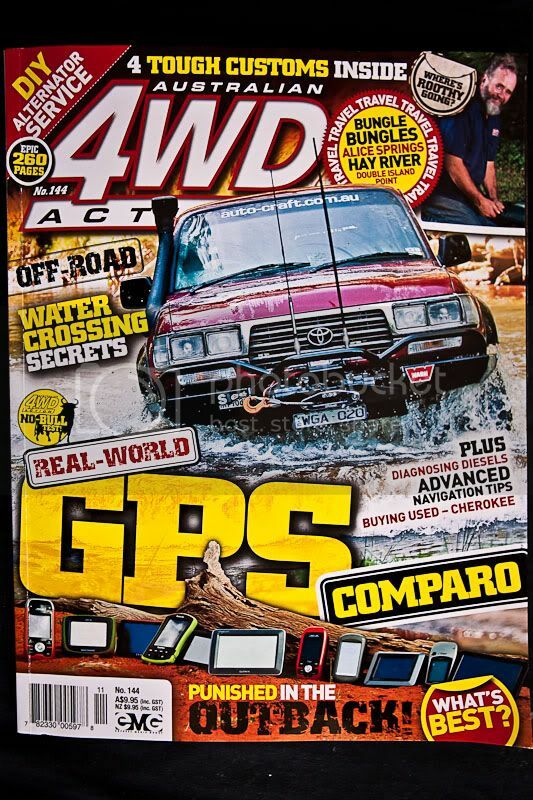 Get your snorkel checked by your local 4WD specialist to make sure that all of the joins are watertight. Assuming your dealer or aftermarket installer has installed the snorkel to be watertight could be an expensive guess. A simple test is to hold a heavyweight plastic bag over the snorkel head while the engine is running and if the snorkel is airtight the vehicle should stall. Tightening or replacing clamps should fix any leaks but if not then use a good quality flexible silicon sealant around the joints. If you love playing in the wet stuff then silicon up all the joints anyway. Next priority is to keep water out of the gearbox, transfer case and diffs. Fitting breather extensions is a fairly cheap DIY task that we’ve covered before. It involves extending the existing breather tubes all of the way up onto the firewall in the engine bay. Quick, simple and effective – just do it! There are plenty of kits available for installing diff breathers but for simple DIY use a length of fuel hose, sized to suit the little barb on your diffs or gearbox, and run it all the way to somewhere up high on the firewall in the engine bay. Make sure you have enough length to allow for suspension droop and run the hose along the chassis. As long as you don’t squash the hose when securing it and avoid any tight turns it will work well and your diffs will love you for it. Finish it off in the engine bay with a fuel filter or catch can to reduce the chance of dust or moisture being drawn down the line. The last items should be done just before you attempt to drive through the water. These include fitting a tarp or blind to the front of the car, removing the fanbelt or tying off the fan if it’s a viscous coupling (check which way the fan spins first!) and spraying water dispersant (WD40, RP7,CRC, etc) onto vulnerable and visible parts of the electrical system. Practice installing a blind before leaving home and most of all make it really simple to use. One that takes twenty minutes to fit won’t get used on your second crossing….. Wet electrics will stop a petrol engine midstream and water sucked into a diesel will lead to expensive noises under the bonnet. Both cases will leave your fourby stranded in the water with your emergency stash of TimTams floating out from under your seat and probably a big hole in your wallet where your money used to be. Distributors require special attention as a little bit of moisture will put out the spark just when you are needing it the most. If you talk to the owner of any British cars from the 50s and 60s then they will start telling you about using rubber gloves with the fingertips cut off and other strange tales. As 4WDers we need to do things properly. First job is to thoroughly clean the distributor and cap both inside and out. Follow this with a light spray of WD inside and out. To really keep the water out some people put a bead of silicon around the join between the dizzy and the cap. Using dielectric grease around the lip is a better option as it’s neater and the cap can be easily removed and refitted. A short length of breather hose from the dizzy vent is the most basic way of keeping the internals dry but for a better solution add a second hose piping in compressed air (low pressure!). Another method is to run a vacuum line from the manifold to the dizzy and the second line from the dizzy into the cabin or other dry area. My preference would be positive pressure with compressed air, activated using switch on the dash. So you’ve arrived at a water crossing and you think your fourby is ready to go swimming. There are a few things you need to do first. The most important one is deciding whether you really NEED to do this. Water plays havoc with electrics and components like starter motors and alternators and every mechanical component under your vehicle will hate you – extended breathers don’t help with greaseable items like prop shafts and bushes. Then you need to consider how well sealed your fourby really is. Door seals can perish and crack and floor plugs can mysteriously move or disappear completely. Having considered all of the above and you’re still going to take the plunge (groan) then it’s time to strip down and go wading. Walking a crossing isn’t just about checking the depth. You should use it to plan the line you will take and any necessary deviations and importantly deciding where you will exit the water. You should be checking for any obstacles like holes or rocks and checking how sound the bottom is. 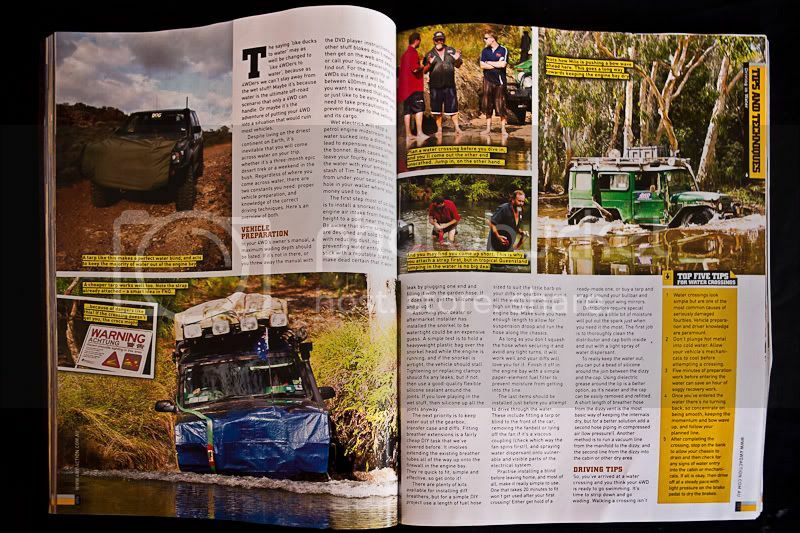 Your 4WD won’t get far if it’s black mud or bottomless quicksand. It may also be worthwhile checking that the water is closer to freshwater than saltwater too or the long term cost of crossing could be huge. Personal safety is important here so non-swimmers shouldn’t be doing this and nor should you try walking across a raging river – be sensible & be safe. Now that you’ve planned your route and checked the depth it’s time to tie off the fan and fit that blind to the front of the fourby. You could also consider attaching a recovery strap to the front or rear recovery points on your vehicle if the water is deep or flowing. 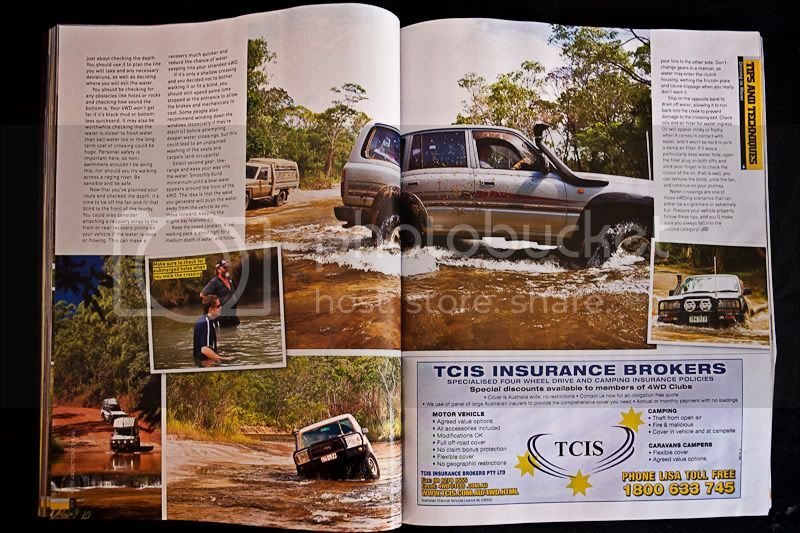 This can make a recovery much quicker and reduce the chance of water seeping into your stranded 4WD. If it’s only a shallow crossing and you decided not to bother walking it or fit a blind you should still spend some time stopped at the entrance to allow the brakes and mechanicals to cool. Some people also recommend winding down the windows (especially if they’re electric) before attempting deeper water crossings although this could lead to an unplanned washing of the seats and carpets (and occupants). 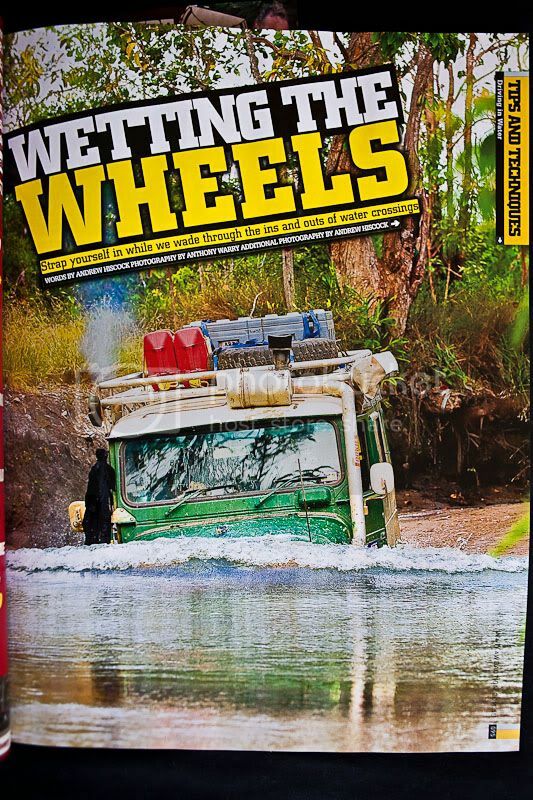 Driving into the water should start slowly then quickly but smoothly build momentum until a bow wave appears around the front of the 4WD (if the water’s deep enough). Keep the speed constant, a fast walking pace is about right for a medium depth of water, and follow your line to the other side. Don’t change gears in a manual as water may enter the clutch housing and cause slipping when you really don’t want it. Stop on the opposite bank to drain off water and check oils and air filter for any water entry. If all is well you can remove the blind, untie the fan and continue on your journey. Like any 4WDing activity start off with easier challenges and build your knowledge, experience and confidence as you go and most of all enjoy it as it’s supposed to be fun. 1	Water crossings look simple but are probably the number one cause of seriously damaged fourbys. 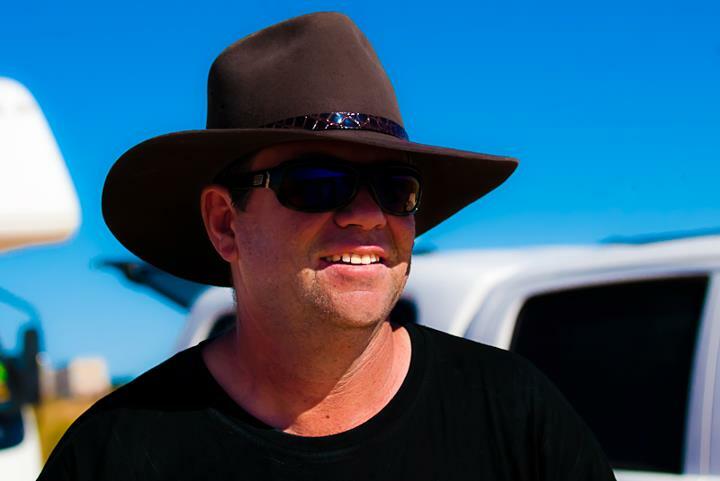 Vehicle preparation and driver knowledge are paramount to doing it safely and successfully. 2	Don’t plunge hot metal into cold water – allow your vehicles mechanicals to cool before attempting a crossing. 3	Five minutes of preparation work before entering the water can save an hour of soggy recovery work. 5	After completing the crossing stop on the bank to allow your chassis to drain and then check for any signs of water entry into the cabin or mechanicals. If all is OK then drive off at a steady pace with light pressure on the brake pedal to dry the brakes. In croc country it’s considered unsafe to walk the crossing so here’s a sure fire technique: Turn your fourby around and back it part way into the water, then drive it out and park it facing uphill on the bank. Soon enough someone will come along from either direction, assume it’s safe to cross because it looks like you just came through! Watch them drive it and if they make it across follow their line. If they don’t make it – run away and claim you were never there. Just kidding……maybe.